Samsung i900 Omnia 16GB: everything but the kitchen sink! 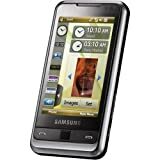 The Samsung i900 Omnia 16GB runs atop of version 6.1 of Microsoft’s Windows Mobile Professional operating system. It supports quad-band GSM/EDGE as well as 2100MHz UMTS/HSDPA (7.2Mbps) network connectivity, with WiFi thrown in for good measure. Highlights of the Samsung i900 Omnia include a large, 3.2-inch WQVGA (240×400 pixel) touchscreen display with stylus support. The display supports auto-rotation for apps and there is a TV-out function for when 3.2-inch just isn’t large enough. The Samsung i900 Omnia supports many different music and video formats, including Ogg Vorbis music and DivX and Xvid video. An FM radio is also included in case you forget to load up the i900’s 16GB internal storage with your favorite music, and you don’t have a microSDHC card lying around. Music can be enjoyed with wired or Bluetooth wireless headsets, thanks to the i900’s A2DP stereo Bluetooth capability. The Omnia also sports a high-spec camera, as well. The camera uses a 5 megapixel CMOS sensor with an autofocus lens and has such high end features as face and smile detection, image stabilization, wide dynamic range mode, and an automatic panoramic mode. A built-in GPS module with nav and geotagging capabilities is also on-board. The Samsung i900 Omnia uses Samsung’s TouchWiz user interface extensions on top of Windows Mobile. This means that users are free to navigate with taps, sweeps, or drags and drops as well as use the built-in optical mouse controller. Text input is handled by an on-screen virtual QWERTY keyboard.